Words by Kevin Doocey on July 12, 2011 . He has a lot to learn the young man; how to conduct himself and eventually realise he is living the dream of many young boys. Playing for Newcastle United is an honour for any player. Nile Ranger is a 20 year old forward who has bags of potential; indeed potential to be as good as anything we’ve produced in quite a while - including Andy Carroll. A lot of people seems to think he would be better off far away from St.James’ Park but there is a number of fans that see his potential; the hassle he causes for CB’s when he comes on. Of course many people point out his miss against West Ham in our five nil beating of them, a terrible miss agreed but I’ve seen worse - a lot worse. Those same people fail to mention or remember his performances against Liverpool, Chelsea and Arsenal in particular. All our goals against Arsenal came when Nile Ranger was brought on as substitute - and nearly assisted Kevin Nolan for the winner at the death. There’s little doubt that they guy needs some wising up - he has to begin to act like a professional footballer, not like some ‘wannabe gangster’. Now let’s not forget there’s quite a few of those in football and in every sport but it’s something that you’d expect to ‘ware’ off shortly after your teens. 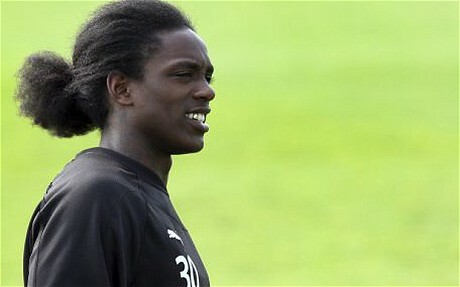 Nile Ranger isn’t quite there yet - but improvements are being made. Alan Pardew has warned Ranger on a couple of occasions about his conduct however it seems the ‘gun poise’ is the final straw for the hierarchy of this club and they are willing to move him on for the right price. Only yesterday it was expected that he would complete a move to Blackpool however, personal terms could not be agreed and in short words - Ranger didn’t have any intention in moving to Bloomfield Road on a permanent basis. It’s of little surprise to me personally to see Sam Allardyce sniffing about and considering a move for the former Southampton youth player. A physical forward that is good both in the air and with his feet - a dream player for the West Ham boss. I certainly hope he doesn’t end of moving to London, but the very fact it is London calling; the 20 year-old could very well be swayed, as would our board once a fee was agreed. I see to be one of few people that have a lot of hope for Ranger. I honestly think he has immense potential and it’s just unfortunate that he didn’t score for us in the Premier League this season. There’s no doubt in my mind that the youngster can make it in the Premier League and score goals on a continual basis. He is such a hassle for defenders when up against him - highlighted all season if you happened to watch when the English U-21 made a cameo appearance. Laurent Koscielny will tell you he’s certainly a nuisance as we saw the Arsenal defender having to drag Ranger down when racing away for a one-on-one at the Emirates Stadium. The deserved red card was then issued and as we all know - we recorded a very impressive away win with Chris Hughton in charge. I hope we don’t see Ranger leaving the club on a permanent basis this season; a loan spell in the Championship could show us what he’s really made of and if that happens and he does indeed goal on loan - then come the end of the season a lot of people at NUFC might be thanking their lucky stars that they didn’t let the 6’2 forward go. Well said.I too like this lad and the way he got among Liverpool and changed the game tells me he is worth hanging onto.A season loan would suit him.Especially when it's said we only want 1 million for him.Make no mistake if we sell this youngen he will come back and haunt us. I'm glad I'm not the only one that sees Ranger as a diamond in the rough. He needs the kind of off-field counseling Joey Barton got in order to mature and realize his potential. Right now, I think the bar fly hanger-ons have his ear and he won't realize where that takes him until he can't p[ick up the bar tab anymore. Then he will be down and out, and the next sucker with potential will have come along to keep the drunks in suds. Agree - why sell him for such a low fee (1-2m) at this stage when we could easily loan him out as suggested and let him prove he can mature as both a man and player? I see this as a win-win: if he then can't buckle down and perform regularly in a championship side we know beyond any reasonable doubt we need to sell him on. If, however, he starts realising his potential - and I too believe he has that - we've added at the very least an improving impact sub and valuable squad player short term... and maybe, just maybe, something more in the medium to long-term. WE SHOULD NOT SELL RANGER!!! He has massive potential and I agree fully with the article. It's madness to throw away the opportunity of developing an already promising young player. He is so close to making it BIG that the thought of selling him sends a shiver down my spine. We need to keep these sort of players and loan them out. That is the only way they will develop quicker and mature without being a liability to us in terms of points and hindering his progress on the bench. seems like everyone agrees - a loan would be the wise move. let's hope the club hierarchy have the same idea! Indeed, I don't see how a loan signing would hurt. Give him a chance to play regularly and grow up a bit, an opportunity he hasn't had, then reevaluate things this time next summer. Chances are you will at very least get more than a few million for him.